Mexico is an open society by North American standards. 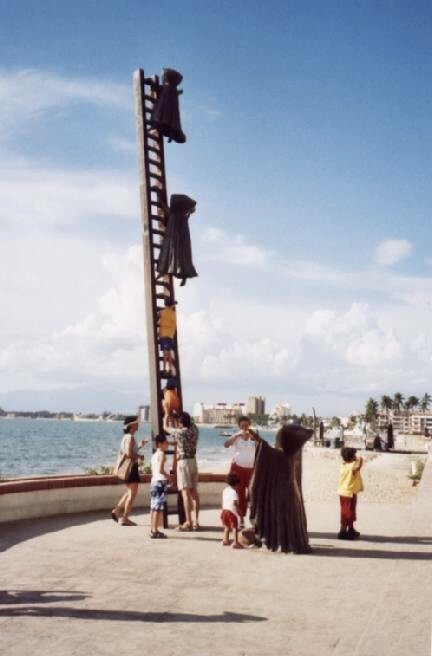 By this I mean that people, especially in the tropical coastal areas of the country, spend a considerable amount of time with their doors open: visiting with their neighbors, kids playing in the streets, or working outdoors doing physical labor. 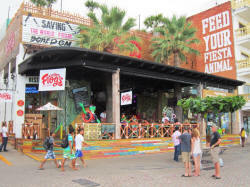 The Mexicans love to talk, visit, listen to music, drink, play soccer, party and enjoy the company of their family and friends. So there is a lot of activity in Mexican neighborhoods. 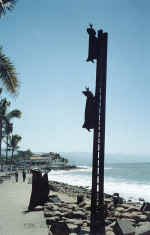 Mexico is still a traditional society in many ways. 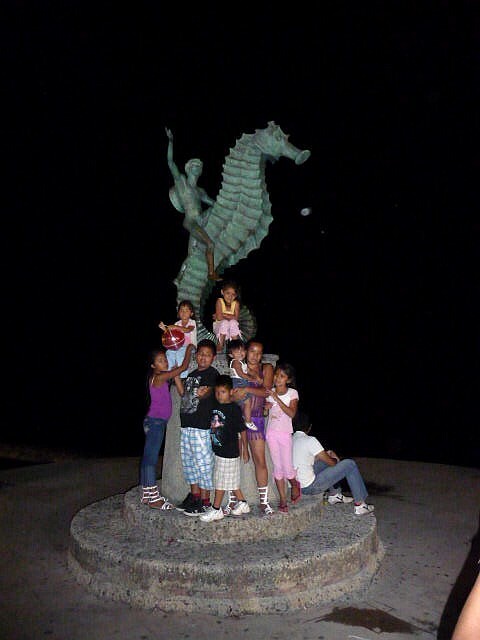 People in their neighborhoods know their neighbors' names and the names of their neighbors' children, which is an amazing fact to anyone who has spent most of their life living in a larger American or Canadian city or suburb. 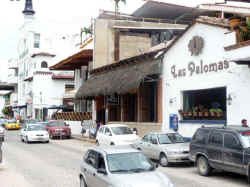 It is not unusual to see an entire neighborhood in the street celebrating the birthday of one of the children: the street will be brightly decorated, there is loud music, food and drink, and often a piñata full of candies and sweets is swinging overhead as the blindfolded kids try to break it open with a stick. 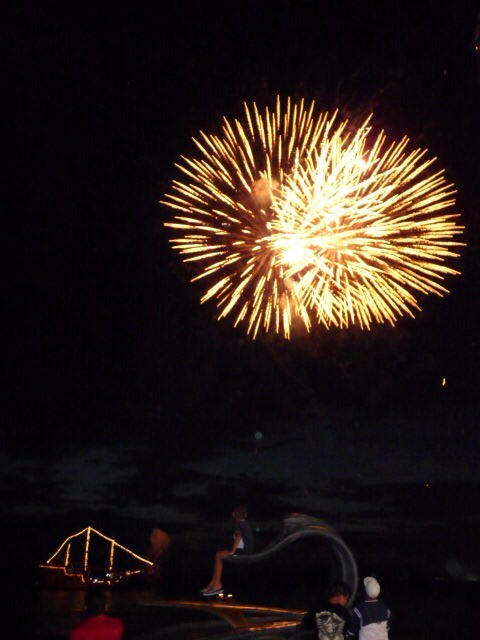 Wakes are still often held in the home of the family, with many of the neighbors in attendance through the night. 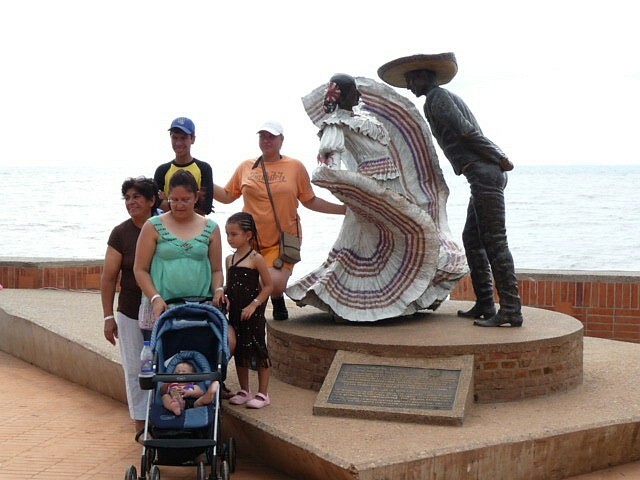 A local custom to follow from these traditions is the popularity of the downtown Puerto Vallarta malecon and its many local attractions and artwork. 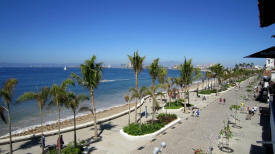 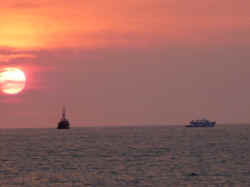 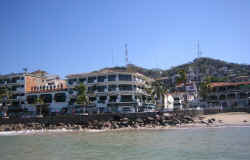 The Malecon is the Heart Jewel of the town, the historic center, and its main man-made tourist draw, a one mile long seawall promenade or boardwalk that stretches the length of downtown Vallarta from the Cuale River at the south end to the Hotel Rosita in the north, some 15-16 city blocks. 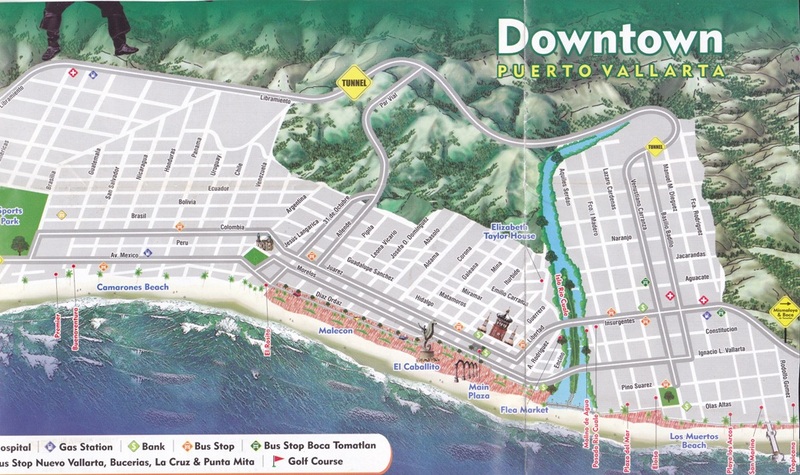 Check out the Map I have below at page bottom. 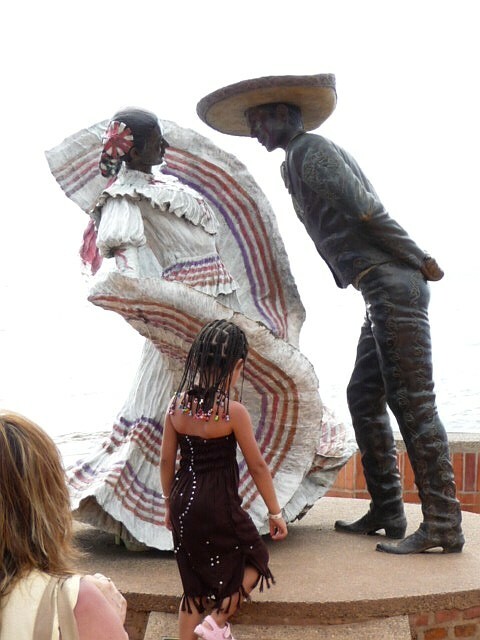 Near the south end of this waterfront boulevard is the large outdoor amphitheater Los Arcos (the Arches) where entertainment and many outdoor attractions occur such as the Xiutla folkloric dancers, live music, cultural events and the ever popular clown shows in the evening. Strolling north, one passes numerous Puerto Vallarta landmarks, attractions and statues including one of this beach town's most beloved pieces, the Friendship Fountain, with its three dolphins by sculptor James Bottoms which was donated to PV by Santa Barbara in 1987 (notice the boy in the traditional Huichol/Cora Indian clothes on the left in the Fountain photo, below right). 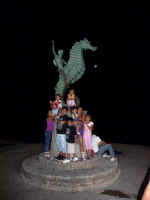 Then there's the famous nine-foot high statue of the youth riding The Sea Horse, a Puerto Vallarta symbol. Sculpted by Rafael Zamarripa, this beauty has stood for over 35 years in the central part of the malecon since 1976. 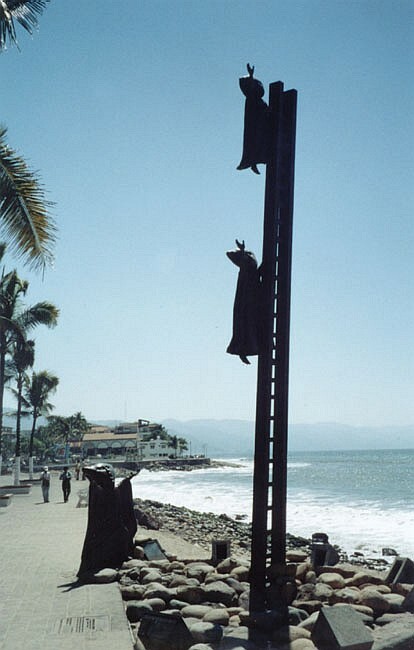 One of the more popular additions to the Puerto Vallarta malecon, the sculpture In Search of Reason by Guadalajara artist Sergio Bustamante, has two pillow-head figures ascending their ladder to the sky. 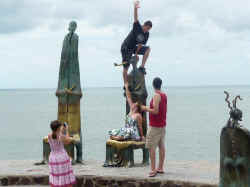 People love to climb this one and have their picture taken. Then there's the recently placed group of strange abstract bronze figures by Alejandro Colunga entitled The Rotunda of the Sea with its half human, half alien sea or space creatures. 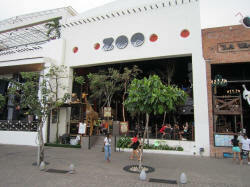 One must see, then sit on them as they are half in the shape of chairs and tables, to experience their odd effect on the senses. 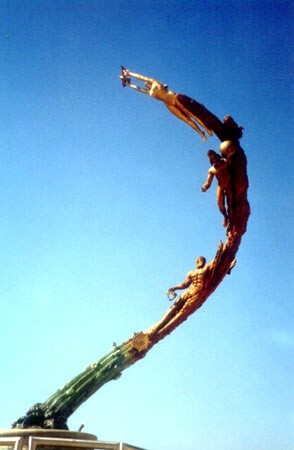 Tapatio Adrian Reynoso's unique blend of bronze and polymer resins, Nature As Mother, a spiraling wave on a snail appears next on the walk north. 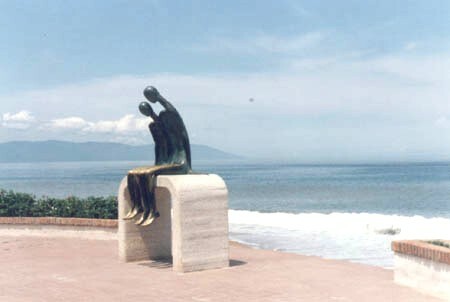 At last we come to the bronze sculpture of the hetero couple in love immortalized in La Nostalgia, a Puerto Vallarta landmark since 1984 by Ramiz Barquet, which I adore. 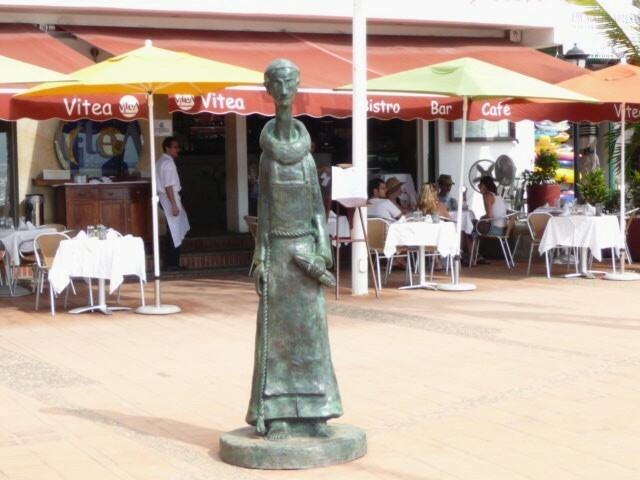 Barquet (1920-2010) has more public art on display in this beach town than any other Puerto Vallarta artist. 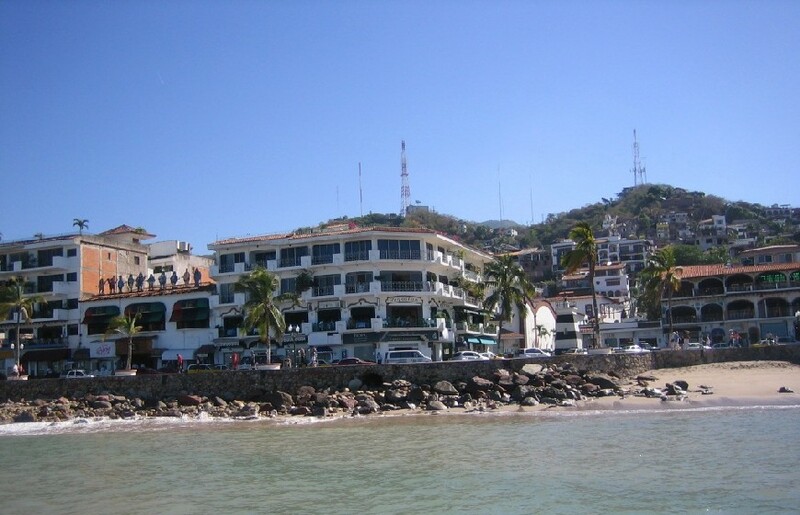 At the north end of El Malecon in Puerto Vallarta is the local fishermen's open market, where fresh fish caught the night before can be bought at a good price. 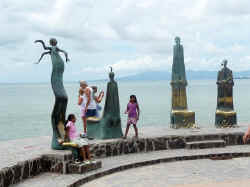 Just past that end of the boardwalk and down the short half block to the beach by the Hotel Rosita is the 2001 sculpture The Millenniums by Mathis Lidice. See the two photos of this beautiful and moving work below. So there is quite a collection of beautiful public artwork along this boardwalk walkway, untouched by spray paint, as you can see in the photos below. 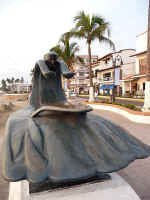 In fact, the amount of top-notch art on public display makes the town outstanding among tourist destinations in Mexico. 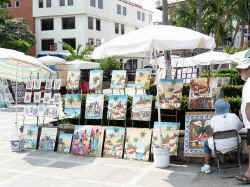 During the day and into the early evening one can also find local artists painting and displaying their watercolors for sale. 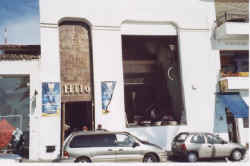 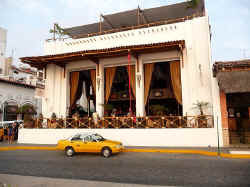 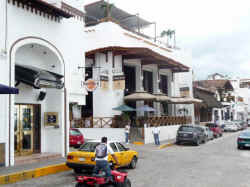 There are also a good number of restaurants (Mariscos Tino's, Cerveceria Union, La Chata, La Dolce Vita, Paradise Burger, Senor Frogs, and Mi Querencia, a relatively new downtown restaurant, to name a few), eateries and taquerias in the malecon El Centro area, hundreds of stores, gift shops and boutiques, as well as many first-rate Vallarta art galleries. 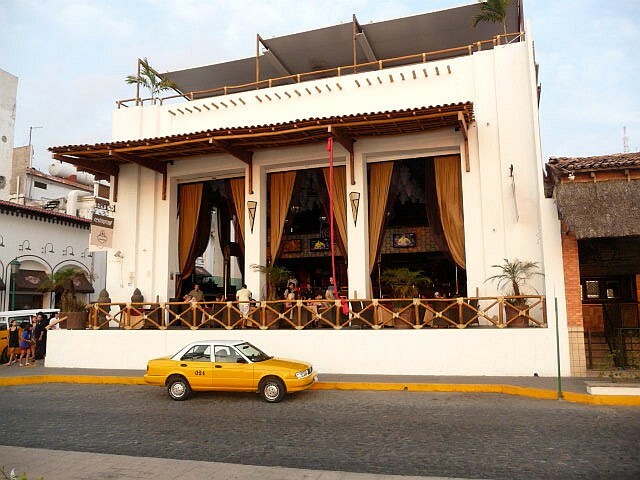 The most popular straight Puerto Vallarta nightlife area is of course along the downtown malecon strip itself, while the Vallarta gay bar & club scene for the most part is situated in the South Side or Old Town area, south of the Cuale River. The Puerto Vallarta malecon boardwalk is popular at sunset and up until around 11pm or so, by which time most people are returning home or headed out to their favorite downtown night clubs. 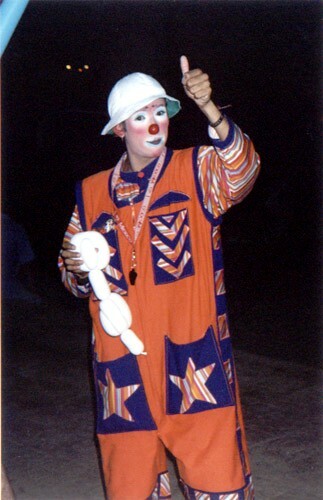 Half the town dresses up and turns out to stroll on Saturday and Sunday evenings. 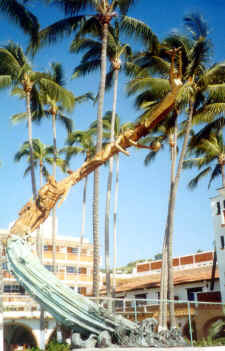 Justin Burch offers his fine assessment of the Puerto Vallarta boardwalk. The malecón can also be a good location to make friends. 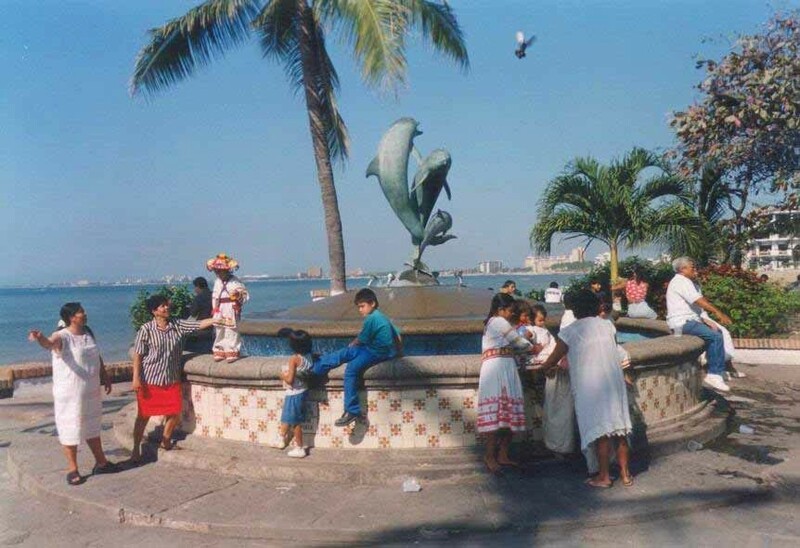 The south end of the malecon between the boy on his seahorse and The Arches/Los Arcos was once upon a time a more frequented meeting and conversation spot for gay men. Several years ago the city completed an extension of the malecon, the new Malecon Extension, at the southern end of the old main malecón, so that you can now continue walking along the ocean-front from downtown PV over to the South Side or Los Muertos beach area. Follow the people around the back or front of the Los Arcos/the Arches Amphitheater area and you will go along the seawall promenade to the footbridge over the Cuale River - you soon end up at the northern end of the Olas Atlas area and Los Muertos beach. 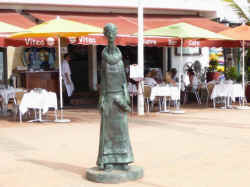 Along the way there are a number of pleasant art works and sculptures. 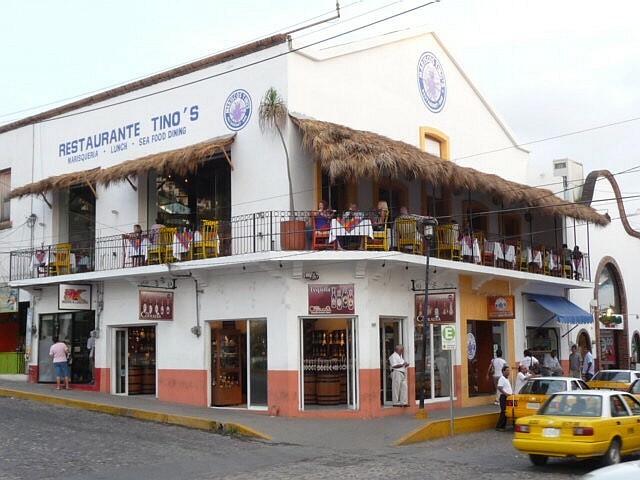 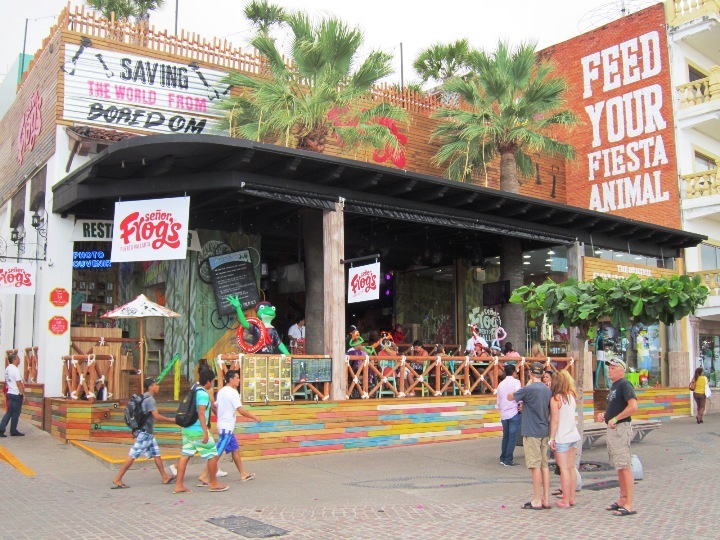 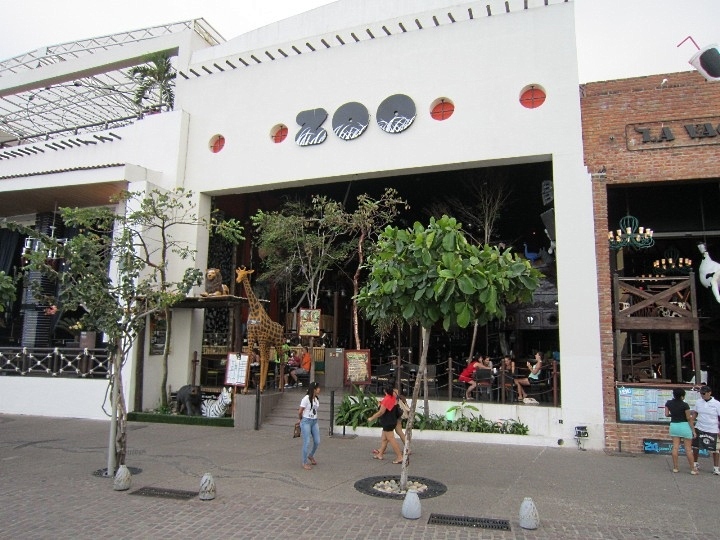 This area has become a particularly popular hangout as one can catch a bite to eat from one of the food stalls, taco stands and restaurants, or stop at a dessert shop or bar along the way to relax and people watch. 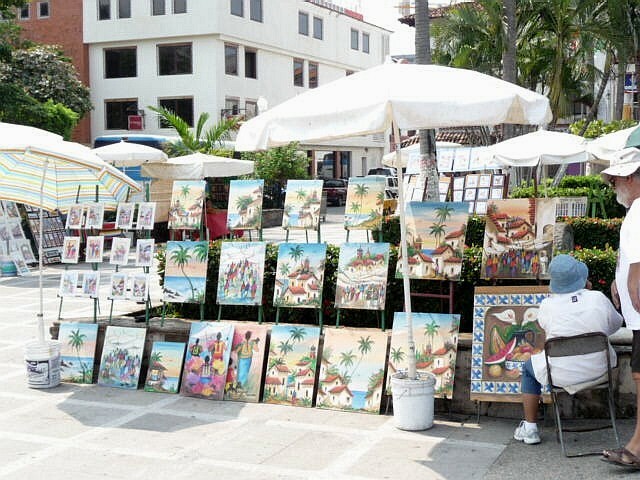 In addition there are small shops, vendors, a municipal flea market and street artists creating and selling a variety of Mexican handicrafts, souvenirs, jewelry, trinkets and gifts for friends or family. 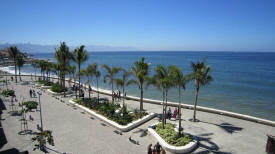 Furthermore, the New Malecon is quieter than the main malecon as there is no auto traffic. 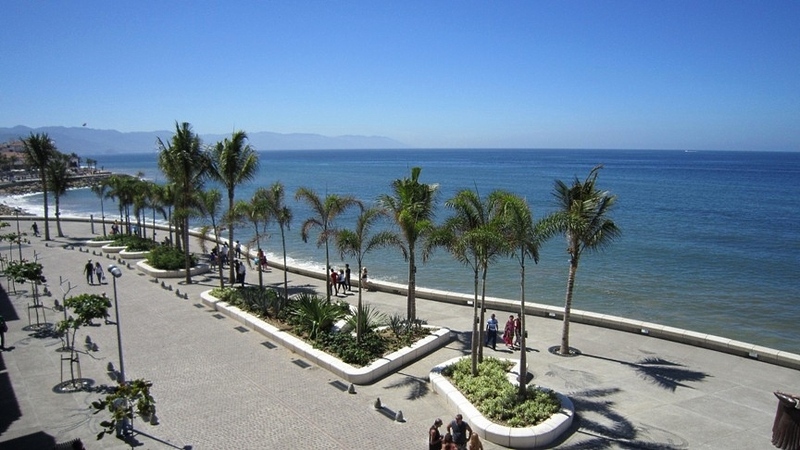 Take a look at even more Puerto Vallarta malecon pictures (of the Extension and traditional walkway before the 2011 renovations, like most of the images on this page). 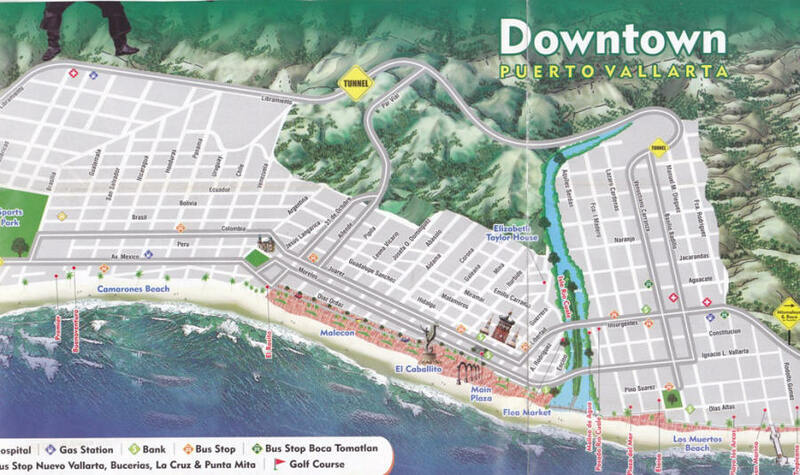 I will be referring to the newly built, renovated part now as the New Malecon and continue calling the portion from the Cuale River to Los Arcos amphitheater the Malecon Extension. 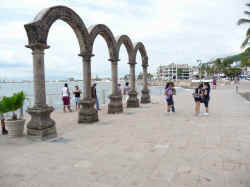 Note: Go here for a walking-photo tour from the South Side and pedestrian bridge to the north end of the boardwalk with dozens of New Malecon photos. 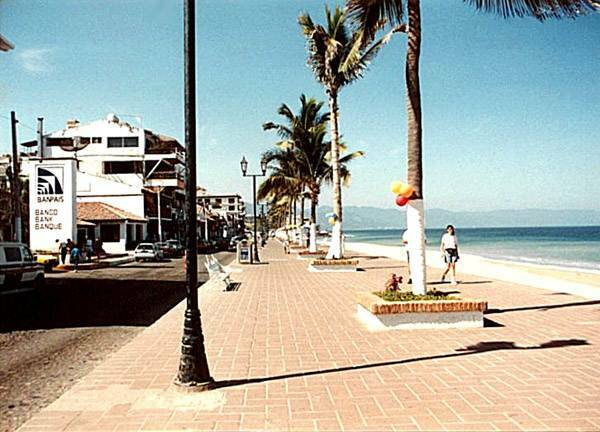 A leisurely evening walk downtown along the Puerto Vallarta malecon boardwalk is a pleasure and a must thing to do while on vacation holiday here. 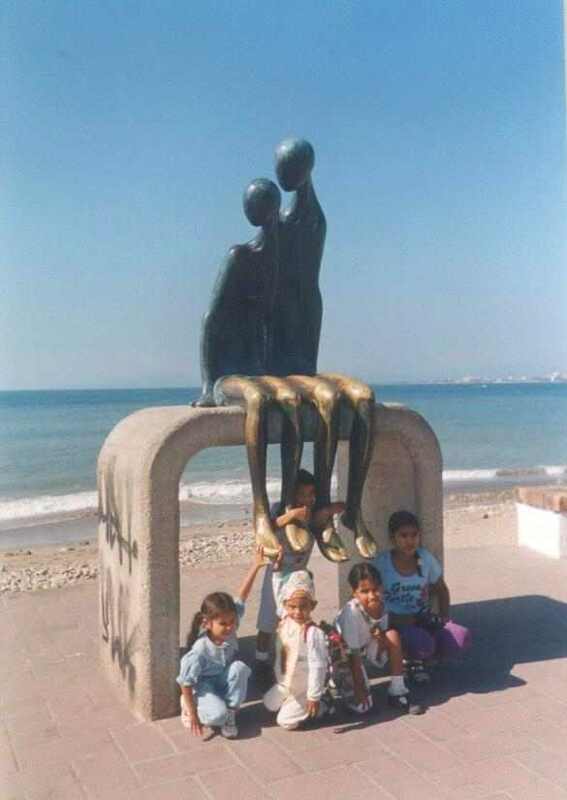 "I love Bustamante's work because it seems to me like creations of a child's imagination coming to life. 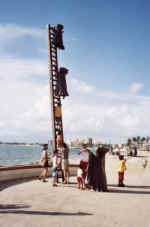 searching for some sort of meaning (hence the title)..."
just past the north end of the PV malecon along the waterfront near the Hotel Rosita. 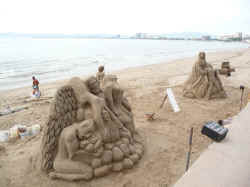 of life that originated in the sea. 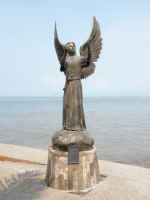 Then there appear different symbols of Christ. and a woman holding a dove for the third millennium. "The whole humankind ascends through time in search of peace." 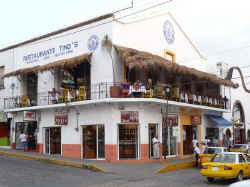 with its main streets of Insurgentes, Basilio Badillo and Olas Altas. 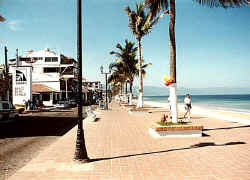 and the beaches from Playa Camerones in the north to Los Muertos Beach and the Pier in the south. 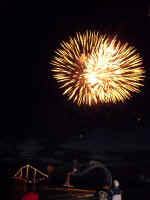 San Marino and the Tropicana. 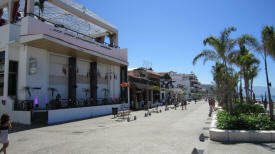 Some of the banks, gas stations and bus stops as well.